US fans of the flamboyant cartoon character SpongeBob Squarepants have set up a church in his name. More than 700 members of the Church of SpongeBob meet for services in New York, Texas and California. The church's manifesto says it wants to push "simple things like having fun and using your imagination", and offers study courses on the cartoon. 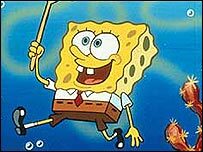 A spokesman for Nickelodeon, which makes the cartoon, said: "SpongeBob's appeal is extraordinary." The cartoon has become one of the most popular children's shows in the US, and has been sold around the world. It features the enthusiastic but accident-prone sponge, permanently dressed in a boy scout's uniform, and his adventures in Bikini Bottom in the Pacific Ocean. Its celebrity fans include Austin Powers actor Mike Myers, Oasis' Noel Gallagher and pop stars Justin Timberlake, Britney Spears and Kelly Osbourne. Recently it was announced that Lost in Translation star Scarlett Johansson would be voicing a character in the forthcoming animated adventure The SpongeBob SquarePants Movie. In the film, she will play a character named Mindy, daughter of King Neptune.